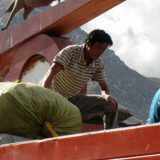 The distribution of aid in Tibet took place between December 2015 and February 2016. 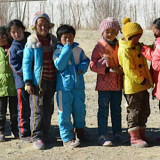 The district we help, Dakshu Shang, in Shigatse province, is one of the most arid and less fertile areas on the Tibetan plateau, about 4,000 metres above sea level. The traditional subsistence economy of the 19 villages in this area is based on the meagre harvests of mountain agriculture, usually not sufficient for even the needs of the family. 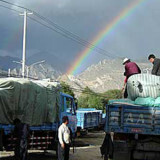 Since a few years possibilities for work on construction sites and factories in Eastern Tibet have opened up, and some people have made this move to ensure an income for their families left in the villages. At the same time, thanks to the constant support of our long distance adoptions project and the constant commitment of the local government, almost all village children are now receiving an education – whereas previously the illiteracy rate was almost 100% in this area. 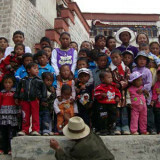 Every year we offer help to all the children and teenagers living in the villages of this area; about 700 are of school age and attend elementary school, which starts at 6-7 years old and includes from the first to the sixth classes, lower secondary school, from the seventh to the ninth class, and the higher secondary school, from the tenth to the twelfth class. 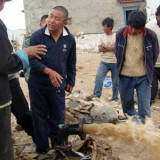 In recent years, many children have completed their secondary school education and have been able to find work in the nearby city of Shigatse. Some students, of whom we are very proud, have been able to attend university in China where places are allotted to the students who get the best results in secondary schools. It is an important change that is giving the opportunity to the villages to build a new generation that is well-prepared, capable of entering the workplace and introducing new perspectives and openings in traditional rural culture. 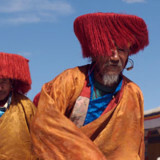 The traditional Tibetan culture is incredibly rich from the spiritual, artistic and medical points of view: an authentic heritage of humanity. Since many years we have been active in our efforts to preserve this culture within the monasteries, which survive only from offerings and donations. 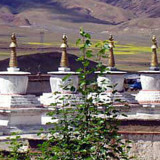 The long distance adoption project is therefore also used to help monks living in several small monasteries in the region. 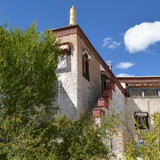 wake up at 4 in the morning and divide their day between prayer, the daily work necessary for the running of the monastery and the activities requested by the inhabitants of the local villages. 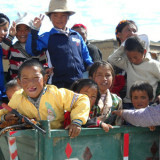 The monks are regularly asked to celebrate prayer ceremonies for births, weddings, for the deceased and for sick people. 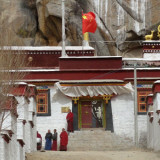 Requests to the monks for advice, comfort and material help make the monastery an essential reference point for the surrounding communities. The reforestation project in this high mountain desert area has been going on for years. Every tree planted here is invaluable. Around the villages thousands of trees have been planted, and with their growth patiently protected they are starting to create large green areas that will play an important function in the lives of the small communities: offering shelter from the strong winds and sandstorms, protection from soil erosion and landslides, shade and shelter from the burning summer sun.